From left: Upward Bound's graduatiing high school seniors Bianca Randolph, Jadon Robinson, Keimark Jackson, Ambrose Porkpah, Taquasia Hickmond, Adam Juah, Dallys Johnson, Abram Mathiang, Nadira Salim, Brian Cody (Assistant Director Upward Bound), Shauna Felician, Dr. Mark Harris, Vice President for Finance and Administration, Queen Billingsley, Stacy Denton, Director of Upward Bound, and Yasmin Robinson, Upward Bound Counselor. Trenton, N.J. -- Spring was celebration time for high school students who have participated in MCCC’s Youth College programs this year. The college’s enrichment programs for Trenton area teens include Upward Bound, Educational Talent Search, S.M.I.L.E./Gear Up, Urban Academic Academy, and the VIP 21st Century Program. 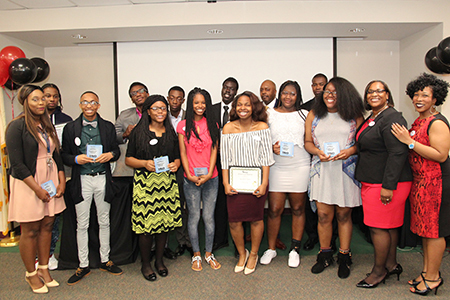 Upward Bound held a ceremony on May 6 to recognize its 23 graduating seniors with awards and scholarships for academic achievement and commitment to the pursuit of postsecondary education. Some of the colleges the graduating high school students will attend in the fall include MCCC, Rowan University, Kean University, Stockton University, Rutgers--Camden University, and The College of New Jersey. Keynote speaker for the ceremony was Barry Johnson, an Upward Bound alumnus who graduated from the University of Pennsylvania in May. In his remarks, Johnson offered college success tips, including the importance of time management. Students premiered a short film entitled “Influence,” which they wrote, directed and performed.